In November 2018, Amanda Brondy, GCCA Director of International Programs, traveled to India joined by Dan Kaplan, CEO – Cloverleaf Cold Storage and WFLO Board Member, and Harshal Surange, a design-build expert with ACR Project Consultants. 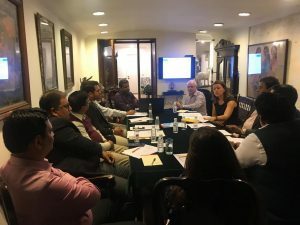 The team hosted a series of Cold Chain Connections in Delhi, Mumbai, and Hyderabad which presented the findings of the WFLO assessment on the cold chain in India. The assessment provides an evaluation of India’s cold chain infrastructure, identifies key observations and conclusions, and provides recommendations for resource development and training in collaboration with GCCA India. Attendees at the Cold Chain Connections discussed the assessment and explored the idea of creating a cold chain operating handbook unique to India. Attendees also evaluated ways to approach education in the country, with a long-term goal of possibly incorporating training program, similar to the WFLO Institute, in the country. GCCA is proud to be involved in strengthening the cold chain in India, and we are looking forward to continuing our work in the country.